Apart from the black you have six other color options to choose from, including beige/sand, sky blue, pink, aluminum grey, charcoal grey, and ocean blue. It comes with a TSA approved lock that can give you a peace of mind. Chester 22″ Cabin Bag weighs only 7 pounds with the exterior measurements of 21.5 x 13..5 x 8.5 inches and meets the IATA approved domestic and global airlines cabin bag requirements. It will fit in the overhead bins of all small or large planes. The interior capacity is 38 liters and measures 20 x 13.5 inches inside. The hardshell exterior is hundred percent Makrolon polycarbonate that is both sturdy and lightweight, obviously lighter than aluminum and more flexible and durable than ABS or other plastic materials. This cabin bag is easy to clean as you just need to wipe with a damp rag. 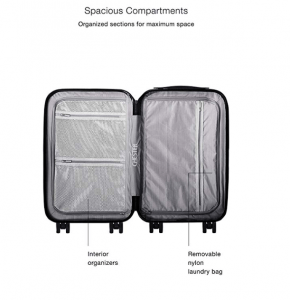 It has the spacious interior organized compartments for your smaller items, compressor straps and even a detachable nylon laundry bag for you to separate your dirty and clean clothes. 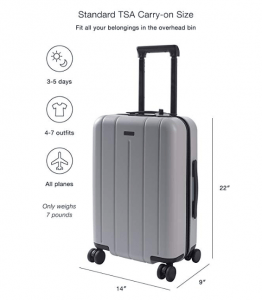 You can maneuver this cabin bag smoothly and effortlessly in any direction on its multi-directional spinners that move 360 degrees on any ground. And you’ll feel as little weight on your arm as possible with the hundred percent aluminum ergonomic telescoping handle that locks at two points. Then you have the easy grab side and top handles for when you wish to lift it vertically or horizontally. The three-digit combination lock is TSA approved by the TSA staff at the airports to unlock it without breaking the lock. The sleek and strong materials used on this bag will help protect the contents of your luggage. You can put more of your stuff in it without going over the weight restrictions on your short or long vacations. The Signature polycarbonate shell is water resistant and flexible in the way that it will expand and absorb the external impact very well. I will continue looking great even after years of use. Please note that this hardshell PC cabin bag is not expandable and doesn’t have an integrated battery pack despite being a high-end unit. The reason for the lack of the battery pack is that these are not allowed to be checked into the cargo hold of planes, according to the IATA’s 2017 regulation. If the wheels break from the usual wear and tear they will be covered by the ten-year limited warranty. It looks very beautiful with a premium feel, is well-crafted, very sturdy, flexible, water-resistant, impact-resistant, has very good quality zippers, zipped compartments, a TSA lock and is offered at a fair price for what it is. You can certainly purchase this bag with confidence and have a peace of mind as it comes with a limited transparent warranty for ten years and hassle-free 30-day returns policy.